The National Zoo and the People's Republic of China hosted a celebration on the first day of a new exhibit that teaches visitors all about the beloved bears. See photos and watch the video. 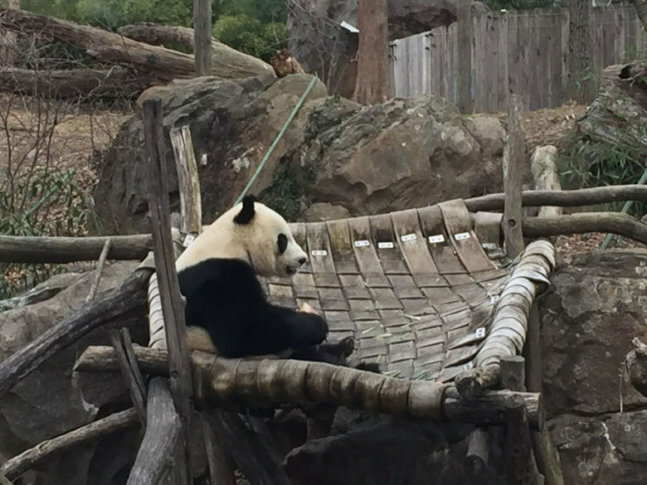 WASHINGTON — Nothing much has changed for the goofy giant pandas and the rascally red pandas. They’re still on display, climbing, falling, flopping and doing all the cute and entertaining things that make the pandas the most popular display at the National Zoo. But on Saturday morning, a ribbon was cut on the new indoor exhibit adjacent to their habitats. The interactive exhibit is meant to inform and educate visitors about what has been learned about the beloved bears. The goal of the exhibit is to channel the charisma of the animals into an educational opportunity. There are graphics, videos and even games that provide visitors with a broad lesson about the pandas, from their biology, to their food preference, to the struggles and successes achieved in the conservation efforts surrounding them. Pandas are still considered a vulnerable species, but that’s an upgrade from when they once stood as an endangered species. And the zoo says as the population rebound, scientists who have tracked them in China are finding out that other animals species are also improving.